WWW.KRIEZELDARIA.COM © 2017. Powered by Blogger. I suffered from wisdom toothache for about 7 years before this procedure. The last straw that made me finally decide on getting a dental surgery was when I couldn't eat and speak for a couple of weeks due to toothache and infections. It was hell in real life. Sorry for grossing you out. 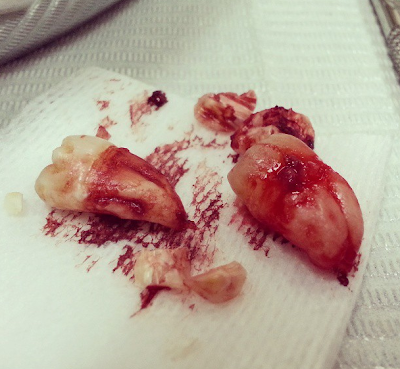 See that small one behind my 2nd molar? That's an impacted wisdom tooth. It's painful. So I asked my bestfriend's mom, Tita Gelyn (a dentist) if she has some recommendations and she said I should go to UP Manila College of Dentistry since many students there are looking for practice patients. I then asked my highschool friend, Josephine, who studies dental med in UP Manila, if she performs wisdom tooth extraction but she said she wasn't at that time so she gave me a number of one of the resident dentists/clinicians at the UP Philippine General Hospital (UP-PGH). I'm not sure if I can post Dra. Elaine's number here. I have to ask her first. She's super nice. I can't think of any other nicer dentist. I'm so lucky she was recommended to me. Anyway, please read below the specific steps on how I got my wisdom teeth removed at a very affordable (actually waaaaay cheap) price than going to private practitioners. I will also enumerate the steps on how you can schedule for an appointment at UP-PGH Dentistry department. Read carefully because there are some important documents you need to obtain. 1. I took the full name of the UP-PGH dentist (Dra. Elaine dela Cruz) and her contact number from my friend. 2. I texted Dra. Elaine my condition and we scheduled an appointment for her to diagnose me and do lab testings. 3. During my appointment, she studied my condition and had me get both panoramic dental xray of my whole teeth and pericapical xrays for each of the wisdom teeth. This was my panoramic xray. 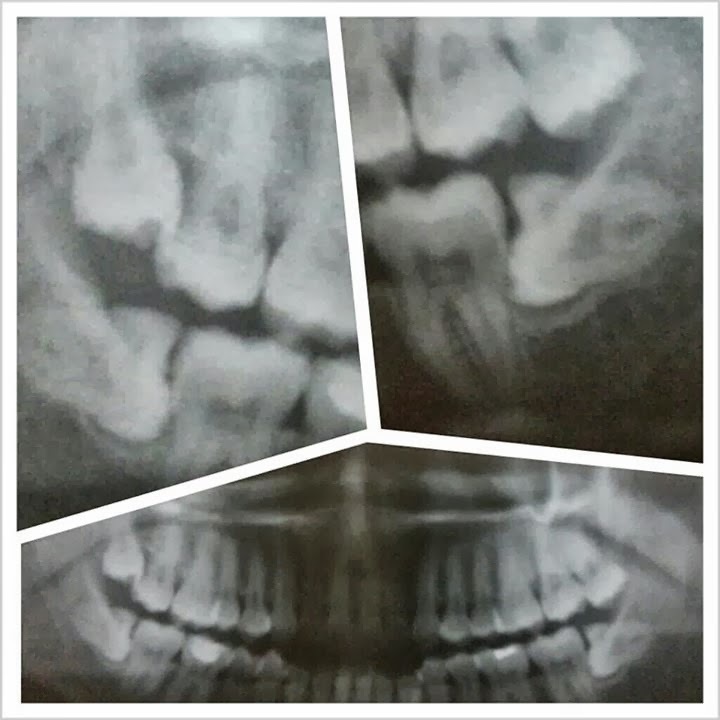 As you can see, the upper left and lower left and right teeth were all misaligned. 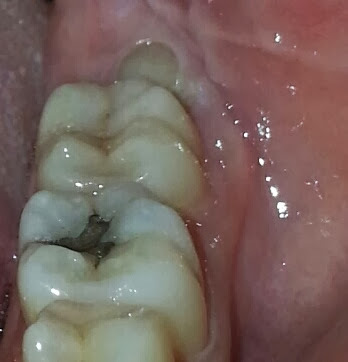 The upper right was ok but since the lower right will be removed, it has to be pulled out too since there will be an irregular bite if it weren't removed. 4. We scheduled my 1st odontectomy (see this Youtube video on how odontectomy is done) session for March 21, 2013 at around 11am. 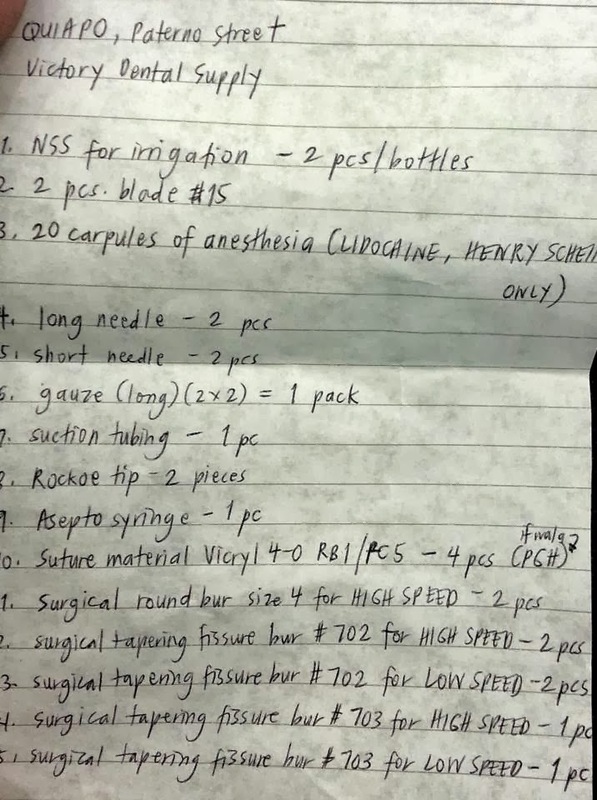 Dra Elaine gave me a list of surgery materials I must buy and bring during my operation. I bought everything in Paterno St., Quiapo (just beside Quiapo Church) except for #10 (I got in PGH Pharmacy). Approximate total cost for all materials is Php 2000. 5. I went to PGH early on March 21 to get my Blue Card. Click here on how to get a Blue Card and schedule for an appointment at UP-PGH Hospital Dentistry department. 6. The procedure was done in 5hrs (removal of 1 tooth only) and I had to come back on April 11 for the next session (removal of the last 3 teeth). 7. After the surgery, I was prescribed some meds I had to strictly take while recovering. 8. Recovery period was about a week for me. Swelling disappeared after 5-7 days. That's all. I actually left some things I experienced but not really necessary for this post (e.g. I had to go to Dra. Elaine's dorm just to finish our diagnosis since the PGH Hospital Dentistry clinic closed at 6pm.) Anyway, it was a painful but effective surgery and I'm so thankful for Dra. Elaine's awesome work. 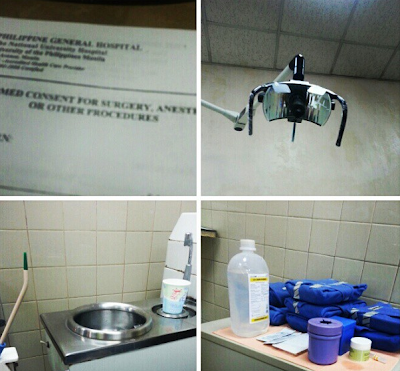 Thank goodness we have cost-effective yet outstanding service at Philippine General Hospital. Here are my pre- and post-op photos. Hihi. Good luck! You can do it! Hi that's very cheap. can you email me her contact number because I am also looking for a cheap procedure.thank you. Hi thank you for a very informative blog. can you give me the contact number of your dentist? Sobrang sakit talaga? Natatakot ako hehe. I have two impacted wisdom teeth. Pero di naman sumasakit.aling part ng procedure masakit? Hi can i get your dentist's contact number? I need to have my 4 impacted teeth removed as well. Thanks! Hi! 4 tooth extraction cost 700 all in all or that is 700 per tooth? thanks! It's actually 3500-4000 pesos for all 4 teeth so that's about 900-1000 pesos per tooth. Of course they are. I guess you are talking about dent students who accept practice patients, right? I think they do that at dent schools, not at the hospitals. regarding scheduling, please expect po na by appointment ang susundin nila. government facility kasi ang PGH - it's a national entity. syempre, nation-wide ang mga pasyenteng dumarating kaya napakarami talaga. Day 1: ittext mo ang numbers na nilagay ko sa taas para mabigyan ka ng pangalan ng clinician na magbubunot sayo. kung magreply sila agad, ok. kung hinde, maeextend ang day 1 mo. Day 2: pupunta ka sa PGH sa schedule na sinet sayo ng mga taong kausap mo nung Day 1. sa araw na ito aaralin nila yung kondisyon/kaso ng ngipin mo. 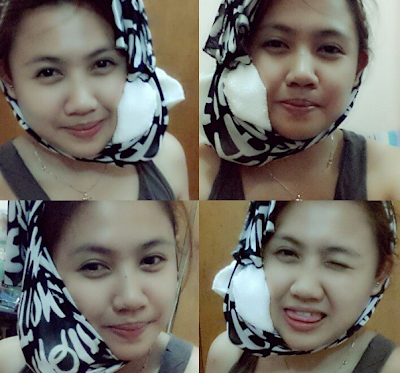 hindi lahat ng impacted wisdom tooth ay pare-pareho. minsan may vein na umikot sa ngipin mo kaya hindi pwede bunutin nang biglaan. kaya sa araw na 'to gagawin yung XRay ng ngipin mo. Day 3: ito yung araw na kukuha ka ng Blue Card at bibilhin mo yung mga pinapabiling gamit at gamot. sa quiapo ito. Day 4: ang surgery day mo. pwedeng matapos nila sa isang araw lahat, pwedeng iextend at pabalikin ka sa ibang araw. Hello! Pasensya na, hindi po ako nagrerefer e. Pakisunod na lang yung post ko tungkol sa pagkuha ng Blue Card para makakuha kayo ng appointment at mabigyan ng clinician. Hi Miss Zeng, can you refer me to Dra. Elaine as well. I need to have a root canal done on my lower premolar. Thanks! hello. may bayad ba ang consulta? Hi! Sa pagkakaalam ko, wala. Basta meron ka na nung Blue Card. Hi. Pwede bang tulog mag pa opera? Hi! Not sure e. But if you follow the process, you can get an appointment even without directly contacting those numbers I gave. Blue card - Go to Hospital Dent at UP PGH - Get an appointment. That's it. :) If you really want to make a call, I found this number on PGH's website. You can try. Hi Kriezel! Does Dra. Estrada have a Makati Dental Clinic? Hi! Sorry I'm not sure. You can inquire from that clinic if she's the same dentist as the one heading PGH Dent. But you'll probably get higher rates there (which I'm sure you already know). 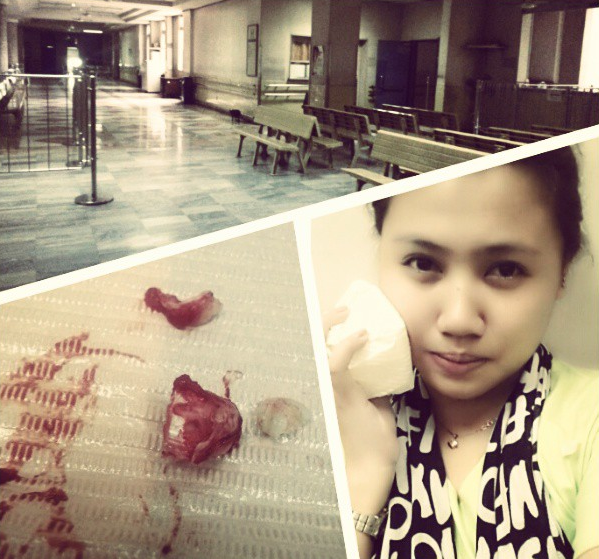 a Filipino Licensed Librarian currently working at the UP College of Law Library. My interests include books, travelling, and digital marketing. I live in Metro Manila with my husband, Allen/BLKD, and our extremely adorable white Spitzu, Krum Theodore.